Sheryl Liow Chia Chyi from Sirius Scholar Study Skills Sdn Bhd emerged champion with her speech titled “Loss of Biodiversity” in the inaugural Sunway College Australian Matriculation (AUSMAT) Pitch Competition 2016, winning herself a bursary of RM16,000 to pursue the AUSMAT programme at Sunway College. Coming in 1st Runner-up was Tan Qian Ing of Rightbridge Academy, who won a RM12,000 bursary to pursue the AUSMAT programme. She spoke on “LGBT Community – The Gender Rainbow”. ausmat pitch 2016 – Winners of the inaugural Sunway College AUSMAT Pitch Competition. (Standing, L-R): Oliver Kee Swee Keat, Cheng Mien Wee, Jemima Fairose, Sheryl Liow Chia Chyi, Tan Qian Ing, A. Alagarani and Vanitha S. (Seated, L-R): Amandan Goon Suet Min, Loh Wye Wye and Yumn Leena Ghrici. Jemima Fairose from Sayfol International School took the 2nd Runner-up spot, “Schools Do Not Educate”, won herself RM10,000 bursary to study the AUSMAT programme. In the competition, Amanda Goon Suet Min of Sri Emas International School, Loh Wye Wye of Rightbridge Academy and Yumn Leena Ghrici of St. John’s International School received the Consolation prize, taking home a bursary of RM8,000 each. All winners also walked away with individual trophies and a certificate of commendation. 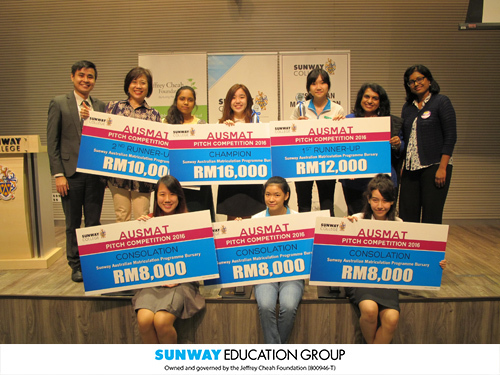 A total of 19 participants from various international and private schools took part in the Sunway College AUSMAT Pitch Competition. In the first Round, participants were required to present their pitch in 2 minutes. 8 participants were then selected to compete in the second Round, where they further elaborated on the topic delivered in the first Round. Present for the final Round of the competition were Cheng Mien Wee, Director of Pre-University Studies, Sunway College and Executive Director of Sunway International School; Vanitha S., Director and Oliver Kee Swee Keat, senior lecturer and the Competition Adviser from AUSMAT; and A. Alagarani, lecturer of the Australian University Programme (AUP).